Brian began his career in the Financial Services Industry in 1981, for the investment management firm Neuberger Berman. From 1987-1990, Brian left the investment field to open a retail business, and then sold it in 1990, to return to the world of investments. Brian joined Charles Schwab & Company, for 10 years starting in 1991, and within two years had been promoted to Branch Manager. He was the manager in Islandia, Melville, Massapequa, and Jericho, and personally handled high net worth clients. Brian was one of 6 managers nationwide (of 350+) selected to manage a new initiative, Schwab “Signature Services” specifically designed to serve the highest net worth individuals. Brian managed two offices ranked among Top 20% for Customer Service by client surveys (Islandia and Melville branches), and was awarded in 1997 top branch in the country for Customer Service. He was also a Chairman’s Club winner for recognition of top 10% results, as well as a Charles Schwab spokesperson for local print, radio and television coverage. Brian was recruited to be the Investment Center Manager and eventual Eastern Regional Director of HarrisDirect (formerly known as DLJdirect and CSFBdirect). He was personally involved in working with high net worth individuals, as well as small business and institutional clients. Brian left to join Fidelity Investments as the Branch Manager of the Garden City office, before managing the Huntington office for 4 years, and then the Flatiron branch. Looking to return to work on Long Island, Brian joined HSBC as Branch Manager in 2011, and then desiring to work directly with clients’ investment needs, was hired by Wells Fargo as a Private Banker. Brian joined Core-X Wealth Management, LLC in 2013 as a Principal and Investment Advisor. In 2014, Core-X Wealth Management, LLC completed a merger with Landmark Wealth Management, LLC. Brian currently serves as a firm Principal as well as Wealth Advisor and Chief Compliance Officer. Brian attended the University at Buffalo majoring in Business Administration. He has held Series 7, 9, 10, 24, 55, 63, and 65, and NYS Health and Life Insurance licenses. 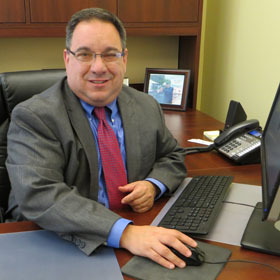 Brian has served since 2001 as a Member of FINRA’s Board of Arbitrators. He grew up in Brooklyn, NY, and has resided in Greenlawn, NY since 1994 with his wife Debbie, their two daughters, Amanda and Rebecca, and poodle/shih-tzu, Buddy.